5/24 Cup of Coffee: It was another tough night down on the farm as Greenville was the only affiliate to pull off a win. They did it in style, as Marino Campana (pictured) and Frankie Rios each had three hits and Kutter Crawford threw another gem. Portland kept it close, but Pawtucket and Salem were each taken to the woodshed. Tzu-Wei Lin and Dan Butler each had a trio of hits, but they had six of Pawtucket's eight knocks as the PawSox fell to Scranton/Wilkes-Barre. Dustin Pedroia hit 0 for 3 with a walk and a strikeout in another rehab appearance, which was emblematic of how things went on the mound, despite Brandon Workman's 2 2/3 no-hit innings in relief. Chandler Shepherd allowed four runs in 3 1/3 innings on seven hits with a walk and four strikeouts. 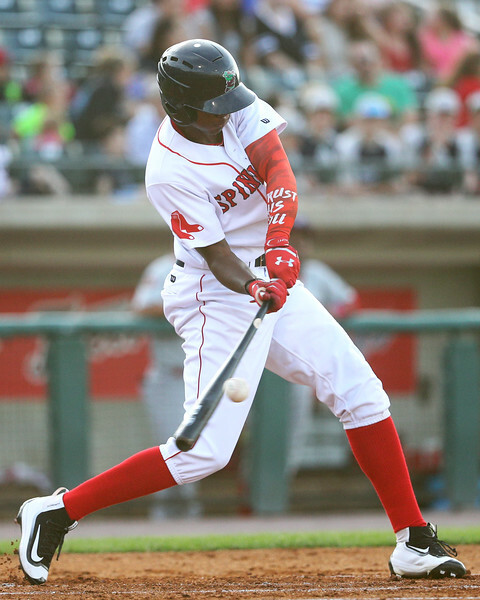 Josh Ockimey and Jeremy Rivera each had two hits, and seven Sea Dogs had a base knock, but Portland could not overcome Hartford's offense. Austin Rei added a home run, but Rivera and Ockimey were the only other hitters with an extra-base hit, and the team could not string enough hits together to score runs. Matthew Kent surrendered eight hits in 5 2/3 innings, and four runs crossed the plate. He added seven strikeouts against one walk. Adam Lau added 1 1/3 perfect innings of relief, striking out three. Not much went right on the mound for Salem as Frederick busted out 23 hits to score 16 runs. Twelve hits and eight runs went on Emmanuel De Jesus' tab to go along with a pair of walks and six strikeouts. Algenis Martinez surrendered nine more hits and six more runs in 2 2/3 innings, including two home runs and Jared Oliver gave up merely two runs on two hits in one frame. He struck out three but also walked three. Offensively, Jerry Downs had a 2-for-4 day with a pair of home runs and four RBI. Roldani Baldwin brought in Salem's final run with a solo shot in the eighth. Frankie Rios went 3 for 5 from the leadoff spot, and Greenville snapped a six-game losing streak in a morning affair. Asheville turned a 3-0 deficit into a tie with a trio of runs in the seventh, but Marino Campana drilled the most important of his three hits, a solo home run in the top of the eighth that proved to be the difference in the game. Kutter Crawford continued his strong start to the year with six shutout innings, allowing four hits. He struck out nine and walked one. Player of the Day: With three hits, including what proved to be the game-winning run on a home run in the eighth, Marino Campana gets the nod. He has multiple hits in each game of his four-game hitting streak and was 7 for 14 with five RBI in the series with Asheville with two home runs, bringing his total to six on the year in his second full season state-side.